We recently received a pre-launch invitation to try out Justin Timberlake’s latest endeavor…NewMyspace. 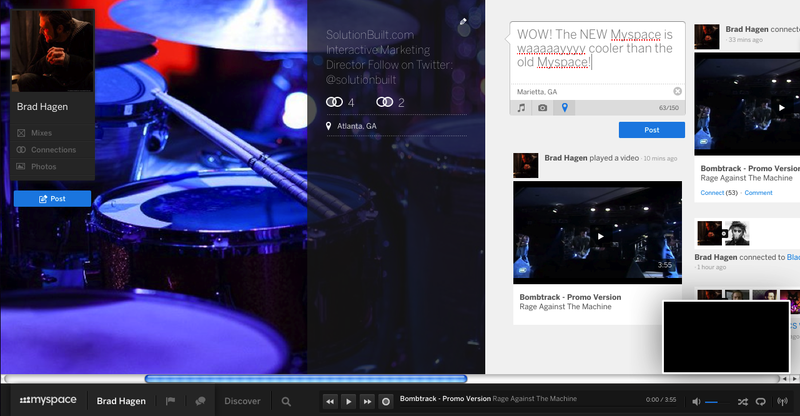 This is MySpace’s third incarnation. In it’s first life, Myspace was just plain bad, but it was unimaginably popular because we had no better reference. Myspace flourished among teens, trashy spam accounts and bad bands. But, it was more fun to use than Friendster! Then the exodus en masse to Facebook happened. Myspace was a desert wasteland. In its second life, Rupert Murdoch’s News Corporation bought it for $580 million. In 2005, he tried to turn it into an ‘entertainment hub’ but instead it became a punch line for comedians for the rest of the decade. A joke that bombed. Murdoch dumped it five years later for $35 million. Now, with the almighty power of Justin Timberlake coursing through it’s code, MySpace is unveiling something new. Not another social network to demand your attention with status updates and photo uploads (although it does include these features). 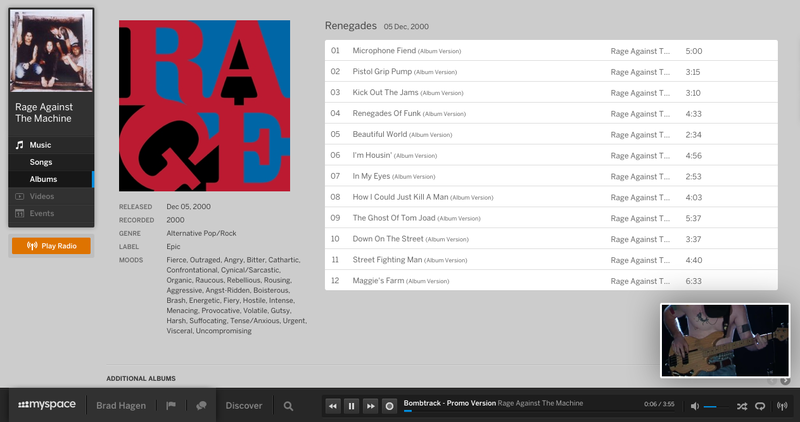 The NewMyspace is something completely new. And because it commanded so much of our collective attention, I’m going to give it one last chance. My gut reaction so far? NewMyspace is in a class of its own. It is visually arresting and makes Facebook look stodgy and antiquated by comparison. You’ll find a design so noticeably different from anything else you’ve encountered that it’s hard not to be impressed. 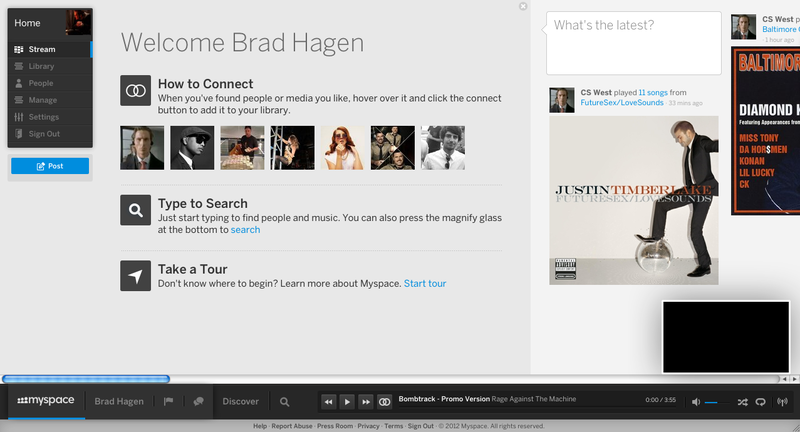 It’s not a mere redesign, like Myspace has attempted in the past. This is a brand new product with a brand new purpose. Designed for artists, creatives and their fans it’s purpose is to create relationships between artists and the content they produce. NewMyspace has clearly taken great pains to differentiate itself from ordinary social network feeds. The full-screen (finally), horizontal navigation is fresh and functional, and the content stream gives a nod to Pinterest, although even this is done much better in my opinion. And the magic bullet is in the seamless music and video integration. It feels and looks like a mashup of the most popular “other” social networks: the sideways, endless content stream similar to Pinterest, the limited, 150 character status update feel of Twitter, a friend suggestion logic similar to Facebook’s and a music streaming service that could rival Spotify’s. The coupling of these features brings new people and content to your stream, allowing for a multitude of new discoveries. When a connection listens to a bunch of music, you’ll see the activity in your stream. You can hover over each song to play the track, add it to a music queue, send it in a message, add it to a multimedia collection (called “mixes”), and so forth. Each of these hover cards also highlights similar content and includes percentages that measure the affinity between you and an object. An hour or two into the NewMyspace experience and you’ll have a good idea of how to make it your own, although you may find yourself lost in some rabbit holes from time-to-time. You will also start to see why NewMyspace is now in a class all its own. Sure, it overlaps with Spotify, Pandora, Google+, YouTube, and Facebook. But it feels different and it IS different. Personally, i’m looking forward to its public launch, with the most sincere hope that NewMyspace will give new meaning to “social networking” by giving the old-guard a run for their money.